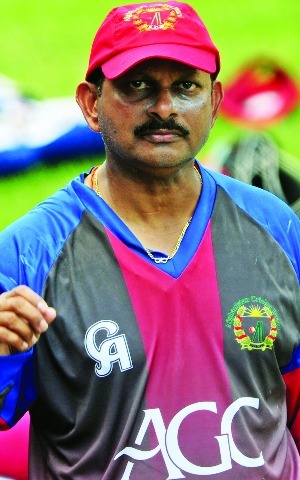 Lalchand Rajput was once regarded as the best opener after Sunil Gavaskar in his playing days but the Mumbai batsman could not translate his promise to International cricket and played just two Tests and four one-day internationals. He was assigned as the manager of Indian team that won the 2007 ICC World Twenty 20 and also coached India Under-19 side in that year. The 54-year old coach, who also worked as coach of Indian Premier League franchise Mumbai Indians and held positions in Mumbai Cricket Association, joined Afghanistan as their coach in June this year. Atif Azam of New Age spoke with Rajput on Tuesday. NA: How is your experience with the Afghanistan team so far? LR: It is a learning curve for all of us. It is a good team with young bunch of players who are very promising. We want to do well and I am sure the coach will make a difference to this team. I am really enjoying my stint with the Afghanistan team. NA: You won the ICC Twenty20 World Cup with the Indian side. Probably there is nothing more for a coach to ask for. Still what motivated to take charge of a team like Afghanistan? LR: I think you have to accept the challenge. If you have that challenge only then you can do better. Coaching in itself is a challenge. I think challenges get the best out of the coach as well as the players. NA: Tell us something about the transformation in Afghanistan batting. I mean the way they approached in the opening game against Bangladesh. LR: I think it is the biggest motivation for me. Afghanistan people knew we were a very good Twenty20 side. I think we have proved that we can also play the 50-over matches and also in the longer formats. The aim is to get these Afghanistan players accustomed with the longer format culture as well and that is how we have been molding these players. Two batsmen really played very well till the 40th over and they showed they have the patience. They have to play big and it is a learning process for all the players. NA: We used to see some aggressive batting from them without giving too much value to their wickets. That seemed not to be the case now. LR: For any change it will take time and I cannot change them overnight. It’s true I want to put the Indian batting culture in the Afghanistan batting. Play big innings and to do that you have to build up your innings and also emphasis on developing big partnership. NA: Tell us something about Mohammad Shahzad. He was quite a star in the ICC World Twenty20. LR: We have to forget about the World Cup and that is a past now. T20 is a different ball game and now we are playing a different ball game. He is a stroke player and can play shots from the start to put the opposition on the back foot but I still believe he has a long way to go. I still feel we have to develop players who can play longer innings and once they are set they have to carry on. That is my intention to make them understand only 40 or 50 doesn’t work so make it big. NA: Is it easy to make them understand? LR: I know it won’t be easy and to start with it will be difficult. But that is my endeavour. I cannot change them overnight. I have to be patient. I have asked the Afghanistan Cricket Board to be patient as well. You will definitely feel a change after six to eight months. NA: Coming back to the bowlers. Certainly there is a change in their approach as well. Unlike before bowlers tend to bowl in the right areas. Earlier they seemed to be over aggressive costing discipline. LR: Exactly. If you want to play international cricket you have to be disciplined. That discipline has to come and I think our bowlers are adjusting to the discipline. We have started showing the world we are changing and we are improving. We have just brought an under-17 guy [Naveenul Haq] in our team and despite the crowd pressure he did exceptionally well when he came back to bowl the second spell. So I think we have young players in our pipeline like Karim Zanat and Rashid Khan to name a few. We got a balance of seniors and youth that will take the team forward. Where do you think we lost the last match? I think everybody asked the same question. It was handling the pressure. That will come through experience. Like Bangladesh have been playing for a number of years at international level. We will improve as we play on matches. The mental side of the game is important and we are slowly getting there. Are the players accepting the changes that you are trying to bring into the team? Yes they are accepting it and that is the best part. They recognise the importance of it if they want to play Test or ODI cricket and certainly they are trying to adapt with the new culture that I am trying to introduce. NA: Lastly, are you going by names as you tend to lose your way once Sakib[ al Hasan] came in the 47 th over you? That is not the case and I have told my players not to go by names. If you go by the names you will never succeed. It was clearly said that if a ball is over pitched and in your zone go after it whether it is bowled by X, Y, Z. We have to accept he bowled exceptionally well and being a senior cricket he deserves all the respect. But that does not imply we were awed by his presence.